At the G-20 Summit in Antalya, Turkey, Barack Obama gave one of the most bizarre performances of his presidency. The November 16, 2015 speech was notable, first, for its gloating over imaginary successes at a time when failures are evident and, second, for the emergence of a new strategy against the Islamic State (ISIS). In the gloating category, the president touted his administration's handling of Libya 26 days after Congressional hearings exposed the lies of Benghazi, boasted of improving worldwide airline security 17 days after an ISIS bomb downed a Russian passenger jet, and hectored his political foes for suggesting he reconsider accepting thousands of refugees from Syria just 2 days after it was learned that one or more of the Paris suicide bombers had come to France from Syria as refugees. It was as though he was trying to eclipse the bad timing of his November 13 interview with George Stephanopoulos, when he claimed to have "contained" ISIS only hours before the Paris attacks. But the short speech and the long Q&A session were even more remarkable for illustrating the administration's deliberate tactic of attempting to embarrass and belittle ISIS verbally – as though words alone will halt its growth. The president referred to ISIS as "simply a network of killers," "a handful of people who don't mind dying" and "killers with fantasies of glory." He drew the facile conclusion that "ISIL pretends that they're a functioning state" and that "we play into the ISIL narrative when we act as if they are a state." While it is true that military power alone is unlikely to defeat ISIS permanently, and that an attack on its ideology is necessary, this new approach is nothing more than the president casting aspersions on the Islamic legitimacy of ISIS and downplaying its operational capabilities and significance. As a strategy, it reveals a shocking failure to understand what ISIS seeks to be and what in fact it has become. Early hints of the president's rhetorical tactic were evident in his first significant speech about ISIS on September 10, 2014, when he claimed that "ISIL is not Islamic" (a claim few believed). This tactic will undoubtedly have the same effect on ISIS that it had on the Taliban when Bill Clinton and George W. Bush contested Mullah Omar's Islamic bona fides and called his regime's crimes "un-Islamic." As Daniel Pipes pointedly asked fourteen years ago, "realistically, which Muslims accept spiritual guidance from the White House?" Turks prepare to respectfully listen to Obama's remarks at the G-20 Summit. Also evident in that first speech was an early version of the attempt to downplay ISIS's significance by asserting that it "is recognized by no government, nor the people it subjugates." Seeking to counter Abu Bakr al-Baghdadi's claim that he had restored the caliphate, Obama decreed: "ISIL is a terrorist organization, pure and simple. And it has no vision other than the slaughter of all who stand in its way." But al-Baghdadi's proclamation of a caliphate and desire to expand the territory ruled by Sharia law are part of a very clear vision. Failing to recognize that vision may have been excusable in September of 2014, but not on November 16, 2015. The president's apparent belief that ISIS's existence depends on his recognition is downright solipsistic. ISIS is an Islamic polity that holds territory greater than Great Britain, stretches over three continents, and has demonstrated the ability to project power throughout the world. It is more powerful than many states, and far more dangerous than all but a few. It is a caliphate accompli. The president's apparent belief that ISIS's existence depends on his recognition is downright solipsistic. Obama is not alone in his view. Current Al Qaeda leader Ayman al-Zawahiri claims that al-Baghdadi is not worthy of the name caliph. The International Union of Muslim Scholars, one of Yusuf Al-Qaradawi's projects, found al-Baghdadi's declaration illegitimate and pronounced it "null and void." Many Western analysts concur. Writing in the Guardian, William Dalrymple finds al-Baghdadi's "self-declaration" dependent on a "flimsy legal basis." Jocelyne Cesari, director of Harvard University's "Islam in the West" program and Georgetown University's "Islam in World Politics" program, argues that since "most historical caliphates were actually fairly tolerant political entities" al-Baghdadi's claim is "kind of ridiculous." Worse still, Raymond William Baker, excerpting his book for Salon.com, argues that "The United States is at war with a very different, mythic Islam of its own making that has nothing at all to do with this Islam of the Qur'an. To make sense of that conjured threat, scholarly studies of Islam or Islamic movements are of no help at all." The president appears to be following Baker's advice. Of course Baker is profoundly wrong, for the history of the Islamic Caliphate is enormously instructive. According to Islamic tradition, after the death of Muhammad in 632, a leader was required to rule the empire created by what the Koran calls the "Seal of the Prophets." That leader became known as the Caliph (Arabic for "successor"), and his empire was called the caliphate. Muhammad's follower and friend Abu Bakr was named the first Caliph – clearly Abu Bakr al-Baghdadi has chosen his nom de guerre carefully. Islamic tradition refers to the first four Caliphs as the "rightly-guided Caliphs" who ruled the empire from the origin of Islam in the Arabian Peninsula. Then came the Umayyad dynasty which ruled the caliphate from Damascus, followed by the Abbasid dynasty, which ruled from Iraq. By the 10th century, the caliphate had grown so large that it ceased effectively to be governed by one entity and fell into a state of tribal dominance. First came the Buyids, then the Seljuqs, and finally the caliphate was subsumed by the Ottoman Empire. The Ottoman growth was not stunted until the Battle of Vienna on September 11, 1683, which began its two-century slide into a steadily smaller and less influential entity. Abolition, for all practical purposes, came after World War I, when the triumphant French and British Empires carved up the Ottoman Empire, but it officially came when Mustafa Kemal Ataturk announced its dissolution in 1924. Nearly a century of irredentism followed, leaving a trail of Islamists longing for the Caliphate's restoration. ISIS already has most of the trappings of a state. The first serious attempt to restore the caliphate began with Hasan al-Banna's Muslim Brotherhood, founded in Cairo in 1928. But perhaps the idea was expressed most succinctly by Syed Abul Ala Maududi's concept of a "World Revolution." Speaking at the town hall in Lahore, Pakistan on Iqbal Day, April 13, 1939, Maududi announced that "Islam does not intend to confine this revolution to a single State or a few countries; the aim of Islam is to bring about a universal revolution." Osama bin Laden was essentially following Maududi in his quest to unite the numerous competing Islamic vanguards into the "World Islamic Front for Jihad Against Jews and Crusaders" in 1998. So while the president denies that ISIS is anything other than a second-rate terrorist group (formerly the junior varsity), it functions very much like a state: minting its own currency, printing its own passports, and running its own schools (which reject the instruction of art but specialize in the art of suicide bombing). Like the original caliphate, ISIS seeks to expand. By reaching out to other Islamists and terrorist organizations, al-Baghdadi is following Maududi's vision of amalgamation. In October 2014, the Pakistani Taliban pledged allegiance to ISIS, prompting fears that the Afghan Taliban will follow suit. In March 2015, Boko Haram pledged allegiance. In October 2015, factions of the Somali group Al-Shabaab pledged allegiance. In fact, according to the Intel Center, 35 Islamist terror groups have pledged allegiance to ISIS, making Maududi's dream of all the vanguards coalescing into one United Jihad Front look like a reality. ISIS has made inroads and struck across the entire Maghreb: cells have been broken up in Morocco, Tunisia, Algeria, Libya, and Egypt. The new Caliphate is even encroaching on the remnants of the Ottoman Empire, where it has carried out a suicide bombing in Sucruc, and killed vocal critics of ISIS such as Ibrahim Abdulqadir and Fares Hamadi. Verbal ripostes and incisive humiliation will not degrade ISIS. The fact that ISIS holds significant territory and is capable of threats more like those posed by nation states than by clandestine terrorist organizations might lead some to include it in a category dubbed the "gray area phenomenon" – which according to Bruce Hoffman denotes a terrorist organization that controls "immense regions or urban areas" and poses "threats to the stability of nation states." Fortunately, when a terrorist group attains this level, it also becomes susceptible to conventional military tactics, as was the case with the Tamil Tigers. The FBI says it has investigations into ISIS cells in all 50 states – territory where no caliphate ever existed, but where Islamists from Sayyid Qutb to Osama bin Laden have dreamed of conquest. Pretending the caliphate does not exist is unlikely to yield positive results. And yet this fantasy has become a significant part of the "degrade" half of the Obama "degrade and destroy" strategy. The belief that verbal ripostes and incisive humiliation will degrade ISIS betrays the mindset of an administration still overly impressed with its rhetorical skills. John Keats summed up this delusional thinking nearly two centuries ago when he wrote: "Let the fish philosophize the ice away from the Rivers in winter time, and they shall be at continual play in the tepid delight of summer." 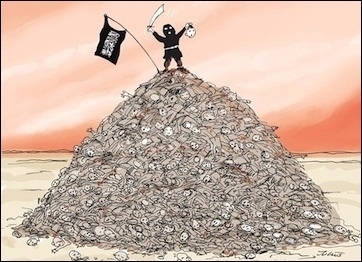 Unfortunately, ISIS cannot be philosophized away.